Welcome to the Spring 2013 THHN Newsletter. It’s been a while since we produced a newsletter but that’s all about to change. From now on we’re going to keep you up to date with a newsletter each month.This one is a catch up on the last 6 months so it’s a bit longer than they will be in future – but hopefully a good read anyway. Thanks for your interest in the THHN – we’re only as good as our network of supporters. The really big news since the last newsletter is the announcement that we are planning to build a bungalow. We’ve long known that there are lots of families who would love to have a THHN holiday but, due to the high level care needs that they have, we are unable to accommodate them. This is where our bungalow comes in. We plan to build or renovate a bungalow somewhere on the English Riviera so that we can offer these families the same opportunity for a bit of respite whilst ensuring that they have all the services, equipment and facilities that they might need. This is a big, long-term project but one that we feel passionately about. It’s the logical next step for THHN. The fundraising has already begun and we were delighted that Babbacombe Model Village got the campaign going by donating a wonderful £500. No, we’re not for sale! However, we now have our very own Ebay store run by the fabulous Jennie Park of Palm FM. If you have any saleable items in good condition that you don’t want but that you think could make some money for THHN simply drop it off at the Palm offices at Lymington Road, Torquay TQ1 4FB or to THHN HQ at Hotel De La Mer, Babbacombe. If you have something for us but can’t get it to us, let us know and we’ll do our best to pick it up from you. Jennie will then put it on Ebay and however much it fetches will go straight to THHN. It couldn’t be simpler. Torbay Half Marathon<>br We are delighted that THHN is one of the nominated charities to benefit from the 2013 Torbay Half Marathon in June. Greg Fine and all at the Torbay Half Marathon have been hugely supportive and to be a chosen charity this year is fantastic news. We currently have a growing band of enthusiastic runners (some old pros and some first-timers) taking part in this event for us. If you would be prepared to run for THHN please e-mail us at fundraising@thhn.co.uk and we’ll help you get started. What links Carlisle and Newcastle? Hadrian’s Wall. This June there’s an event called “The Wall Run” in which entrants are encouraged to walk or run the wall in one or two days. What does THHN founder Luke Tillen plan to do along with his friend and triathlete, Alick Forrester? He plans to run all 69 miles in one day! It’s all part of his big fundraising campaign to help build the THHN bungalow. If you don’t already know, Luke has a fundraising page at www.justgiving.com/Luke-Tillen and, should anyone like to sponsor him for this, or any of the runs he’s undertaking this year, he’d be extremely grateful. On the subject of amazing challenges, how about this? This May an intrepid group of dedicated supporters are taking on the 5 peaks challenge which is pretty much as it sounds. These great people, who all work for EE, will climb, wait for it…. Ben Nevis, Scafell Pike, Snowdon, Slieve Donard in Northern Ireland AND Carrantuohill in the Republic of Ireland. That’s over 5 km of ascent and 60km of mountain paths. To find out more and to sponsor this hardy bunch please visit www.justgiving.com/ee5peaks Good luck guys! June 23 – Hanbury’s Fish and Chips on the Downs Music Festival. More on this and all the other great events in the Festival Marquee this year go to www.babbacombefestival.com. October 13 – Great West Run. More in the next newsletter. Catherine from Alstrom Syndrome UK for all her help and advice. Pride Torbay for raising £262.47 at their summer events last year. Everyone running for the THHN in the 2013 Torbay Half Marathon. All of the accommodation providers who have provided holidays over the past few months. Palm FM for making the THHN one of the benefiting charities of the 2012 Christmas Give a Gift campaign. The Rotary club of Babbacombe and St Marychurch who donated £250 to help fund a holiday for a local family to visit Center Parcs in Cumbria last November. HS Hommers and Sons of Wolverhampton who donated a fantastic Christmas tree for us to auction. Harris Pools and Leisure for donating £250 from the sales of hot tubs. 9 year old Danielle Moore of Brixham C of E Primary School for raising over £117.50 by selling her handmade jewellery at the school’s Christmas fête followed by another fabulous £19.50 at another event in March 2013. Winners 2000 Fitness of Torquay for stocking THHN Memory Maker t-shirts for sale. The Reece Family of Torquay who organised a Christmas raffle raising £124 for THHN. 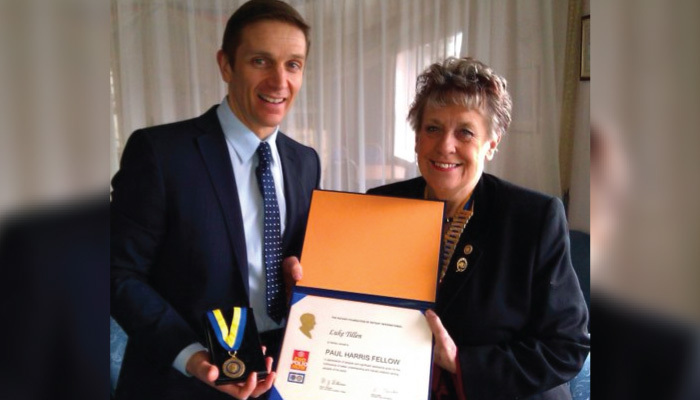 The Rotary Club of Torquay who made founder Luke Tillen a Rotary Foundation of Rotary International Paul Harris Fellow, an honour he was delighted to receive. Jacob, Wills, Angus and Helen Mason (of Animation Therapy) for making a beautiful Christmas animation just for us – check it out on You Tube. Georgia Taylor of Warberry Primary School in Torquay got all her friends to submit pictures, with an entry fee, in an art competition she decided to run for THHN. The winning canvas was painted by 9 year old Merlo Lavender-Moser and was auctioned to raise even more money for THHN. Thank you to all the pupils who took part. Holiday Liaison Officers Angela and John Bunce of Vomero Holiday Apartments who raised £78 through the sales of donated Christmas cards. Torbay and District Funeral Service for donating £200 at Christmas. Torbay Homemakers raised £600 at various events after making THHN their chosen charity for 2012. Malcolm Swift and all the members of Paignton Hotel and Business Golf Society for raising an incredible £1,500. Anne Marie Ostler who raised £57.96 by running the Cambridge Marathon. Abbey Preparatory School who raised £362.88 at their wonderful spring concert. The THHN bowling team who won the Palm FM charity ten pin bowling challenge. And finally, did you know…..
THHN has a hip-hop Theme Tune, written by New York’s Chad Harper and the Hip Hop Saves Lives crew.